Colour Streams has created a range of hand dyed silk embroidery ribbons in 3 widths. All ribbon widths are available in the same beautiful variegated colours. 100% hand dyed silk ribbon, available in 51 variegated colours. 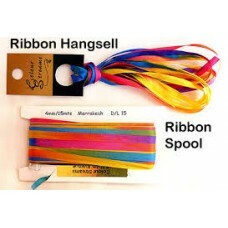 Suitable for all forms of ribbon emb..
100% silk ribbon available in 51 overdyed colours. Suitable for all forms of ribbon embroidery. Avai..